The focus of the Adult Learning Australia Foundation is on ensuring that people who are disenfranchised and disadvantaged have the opportunity to make a valuable contribution to the social and economic life of their communities. We believe that everyone regardless of their age, gender, race, belief or political ideology should have access to opportunities to learn in a non-threatening and supportive environment. living in low socio-economic conditions. The right to literacy is an inherent part of the right to an education. 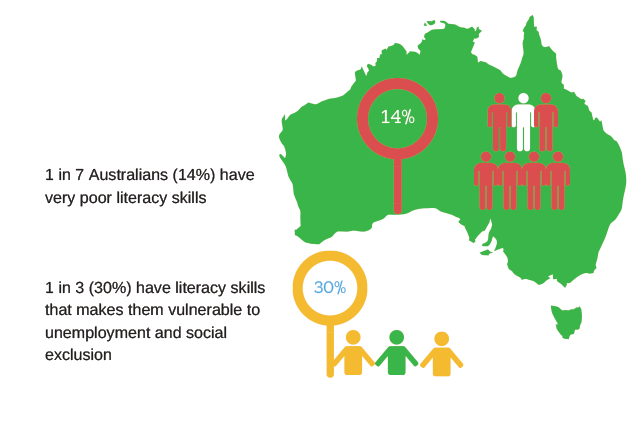 All adult Australians, regardless of their employment or social status, should be supported to fully develop their language, literacy and numeracy skills. However, around 1 in 7 Australians (14%) have very poor literacy skills and 1 in 3 (30%) Australians have literacy skills low enough to make them vulnerable to unemployment and social exclusion. A lack of language, literacy and numeracy impacts all aspects of an adult’s life and has intergenerational effects on families, children and communities. In a rapidly changing society, with technological advances and growing inequalities, adults must have the opportunity to gain and build their skills and knowledge in order to make informed choices and improve their lives. Research shows us that people who disengage from education are disproportionately disadvantaged. Learning empowers people offering strong social returns in productivity, community participation, political awareness and active citizenry. If you wish to talk further about making a donation or supporting the Adult Learning Australia Foundation, please contact us: foundation@ala.asn.au.